Families of victims gathered at a public ceremony in Beichuan, Sichuan Province, on May 12, 2011 to remember the victims of the Sichuan earthquake three years ago. 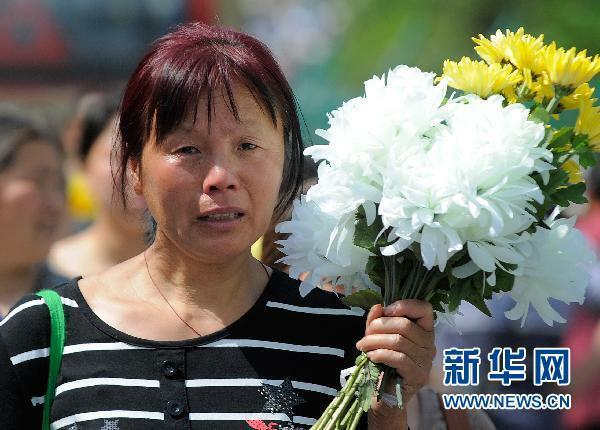 Families of victims, former residents, rescue and reconstruction workers gathered at a public ceremony in Beichuan, Sichuan Province, on May 12 to remember the victims of the Sichuan earthquake three years ago, ifeng reports. A one-minute moment of silence was held, while many people laid flowers at the memorial. Beichuan was the most severely-hit region. China's first museum dedicated to the victims of the 2008 Sichuan earthquake opened Wednesday in Chengdu, Sichuan Province, Xinhua reports. The museum has six sections with 270 exhibits and 559 photos, including those of rescuers, which line the halls. Chinese maritime officials and experts on Wednesday called for more precaution for ocean disasters on the eve of National Disaster Prevention and Mitigation Day, Xinhua reports. Loopholes in China's ocean disaster control and prevention system, such as a lack of radiation testing labs, have emerged during Japan's nuclear crisis, said Dou Yueming, an official from the North Sea Branch of the State Oceanic Administration.